Finally, after more than a year of renovations and preparations, thirsty patrons awaiting the official opening of 26° Brewing Co. can breathe a sigh of relief. 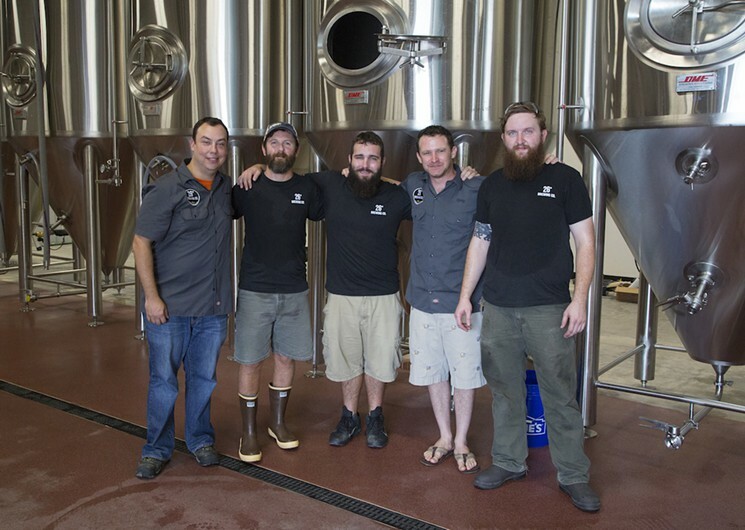 Lieberman and fellow brewery ownersYonathan Ghersi, Oscar Olikowicz, and Billy Silas have decided on a date. The brewery will open for business at 2 p.m. Friday, September 18, and first-time patrons will be able to roam the 4,600-square-foot taproom that features a stage for live music, a 30-seat inside main bar, and a short six-seat bar located inside the brewery itself. Come Friday, a total of 30 taps will pour a first-run selection of yet-to-be-announced 26° Brewing beer. Like much of the brewery space, the taproom design and furniture represent a labor of love for the brewery owners, each table and chair constructed using reclaimed materials. That includes lacquered wood tables and chairs with legs made from fire sprinkler pipe and — most striking of all — large round tables made from repurposed Florida Power and Light wire spools embedded with brewing grain and the 26° Brewing logo. According to Lieberman, the taproom will launch with up to eight 26° beers. Although the final tap list remains a secret until opening day, expect to sip on several that are considered Lieberman’s flagship brews, including an India pale ale (IPA), brown IPA, Scotch ale, lager, and what appears to be everyone’s favorite — a Russian imperial stout dubbed Ziko’s Rage, a beer named for a loggerhead turtle Lieberman helped rehabilitate as a volunteer at the Juno Beach Marine Life Center. Although happy-hour promotions and food partnerships with nearby restaurants are still in the works, expect to find plenty of entertainment to go with your beer, says taproom manager Joey DeChello. That includes weekly live music performances featuring local acts Thursday through Saturday each week. 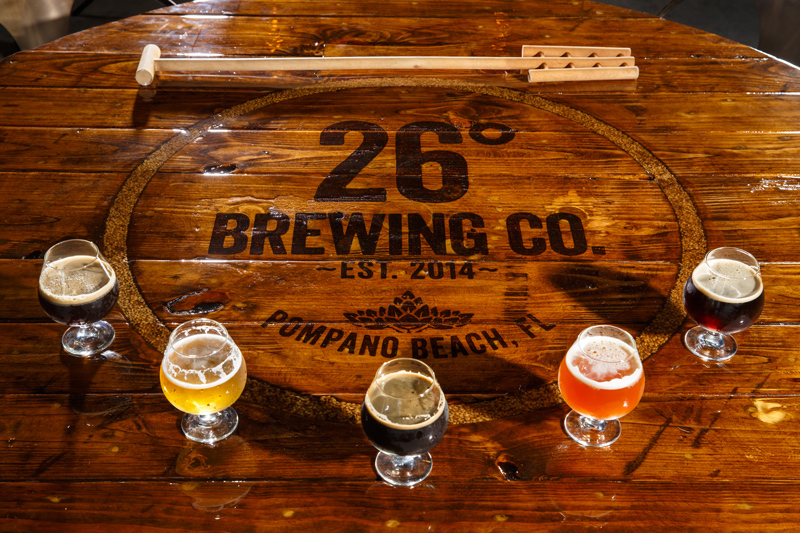 26° Brewing Co. taproom hours will be Monday through Wednesday from 2 to 11 p.m. Thursday and Friday from 2 p.m. to midnight, Saturday from noon to midnight, and Sunday from noon to 9 p.m.
26 Degree Brewing Co. is located at 2600 E. Atlantic Blvd., Pompano Beach. Call 954-532-6964, or visit 26brewing.com. You must be 21 years or older to enter this post. By going beyond this point, you acknowledge that you are 21 years or older.